How Business use Instagram Stories? Social media has been an important part of marketing for many years. Yet the potential of social media has not stood still in that time. The most popular platforms are constantly evolving. They bring users new features. At the same time, providing businesses with new opportunities to connect with their audiences. Sure, there are a lot of new features to keep up with. But if you haven’t jumped on the trend of using Instagram Stories yet, then you could be missing a trick! Instagram Stories was introduced in 2016. It has become a sensation that has swept the world. Of the more than 300 million daily Instagram Story users they are active. The average amount of time spent using the feature is 28 minutes. These figures alone should be enough to convince you that Instagram Stories is the place for your business to be. However, what about the fact that half of businesses who use Instagram have already taken advantage of Instagram Stories? 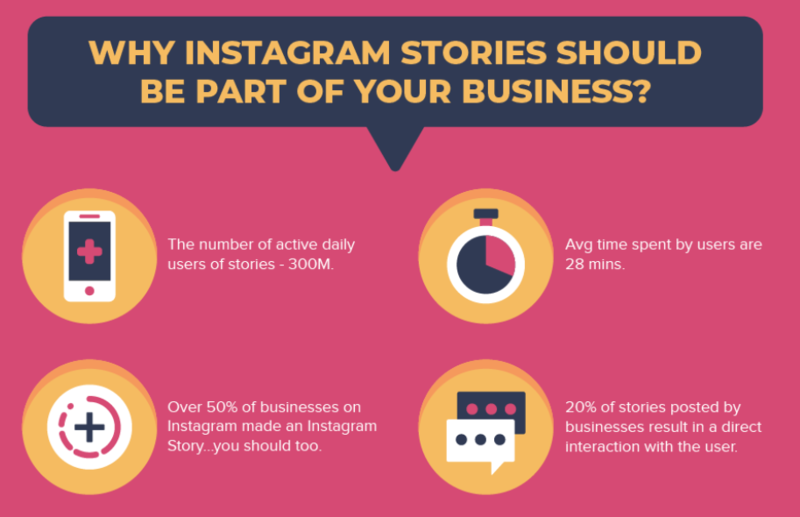 If you need further convincing that your business should be exploring the potential of Instagram Stories, then check out the infographic below,. This is where you’ll find more than 30 cases studies. These outline how businesses have incorporated Instagram Stories into their marketing. WILL YOUR BUSINESS BE THE NEXT INSTAGRAM STORY CASE STUDY? The infographic covers a wide range of case studies in different industries. It shows that Instagram Stories can appeal to all types of audience. From those interested in entertainment and toys to those looking for posts on food and travel. This audience waiting on Instagram Stories is ideal for any business. Using Instagram Stories has multiple benefits. It can reduce the cost of posting content that people engage with. It can also increase the number of people performing an action after viewing the content. Check the Spy Valley Wines case study). Not only that, but Instagram Stories is an advertiser’s paradise. There are 1 million active advertisers with access Ads on Instagram Stories, monthly. Also there has been 120 million user-to-business interactions through Instagram Ads. Instagram Stories can drastically increase the number of mentions with hashtags and deliver millions of comments and likes (as seen in the Sephora case study). Instagram Stories may not be the only marketing platform that you’ll ever need. Although when combined with other online marketing, it can help to boost consumer engagement and provide direct interaction. The success seen on Instagram Stories is an example of how social media marketing can deliver exceptional results. The instant success of Instagram Stories saw 88% of businesses deciding to increase the number of Instagram Story posts in 2018. This is after just a year and a half of the feature being live. Finally, 30% of businesses started 2018 planning to develop their own ads on Instagram Stories. So, with only a few months left of 2018, will your business be joining them? To conclude, if you want to know more about how to succeed on Instagram then check out our comprehensive information right here.